Due to the approach of hurricane Earl, with its capacity to knock out electrical power for up to a week I decided to purchase an electrical generator. I’ve had gas electrical generators in the past, but found that if they lay around for a long period of time the gasoline in them tends to evaporate to some degree and become useless. The gasoline has to be drained and the spark plug or plugs have to be cleaned before the gas powered generator can be utilized. Obviously, this is a problem especially when environmental conditions in your tank are rapidly deteriorating. In my case, I found that one can purchase an electrical generator that is powered by propane. 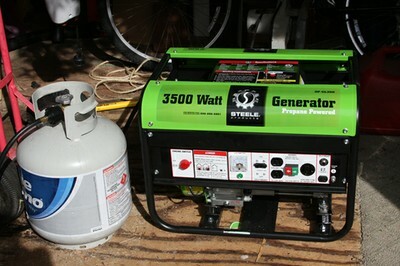 Furthermore, propane generators are available nowadays at a reasonable price. 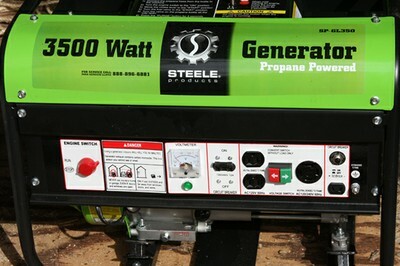 Steele makes a propane generator that produces 3500 W of power at 120 V that will generate power using a standard propane tank, the ones that are used for barbecues, and will generate that amount of power for 10 hours. One can have several of thesepropane 5 gallon tanks available and produce enough electricity to keep your large tank going for probably as long as a week. Another benefit of a propane electrical generator is that they produce far less toxic fumes then does a gasoline generator. Nonetheless, the generator should be used out of doors, or in an area where there is adequate ventilation. Following, are pictures of the generator that I purchased for $500 from Amazon where shipping was free.